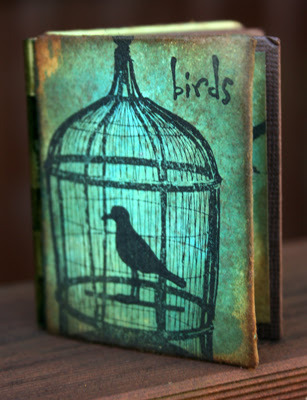 My Creative Existence: Birdie book giveaway!! See how small it is? It fits in the palm of your hand! You can see photos of the rest of it, and details about how I made it, here on the Darkroom Door blog - and guess what?! I'm giving it away! All you need to do to have a chance at winning it is to follow the link to the DD Blog and leave a comment there about what your favourite stamp from the new Love Birds set is! Too easy! Good luck, and thanks for looking! 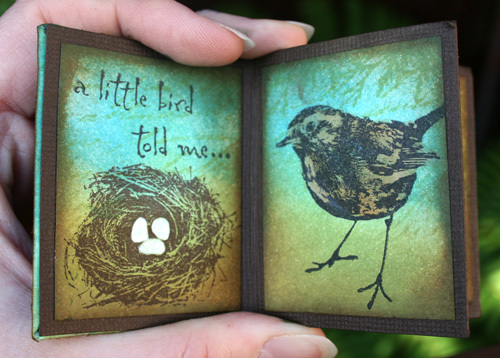 What an adorable mini book...beautiful colors too. I would love to add this to my collection and put it on display for all to see.......I am heading right on over to DD to put in my response. This is just awesome Sarah! Wow Sarah, how gorgeous and cute is this little book!!! This book is so beautiful Sarah and so generous of you to give it away! It's adorable and I love that you've used the text stamps to tell a story.